Northern Ireland is a beautiful place in the north-east of the island of Ireland, part of the UK. The area of Northern Ireland is a roughly the same as Northern Yorkshire meaning this is a fantastic county for an epic road trip! For some fantastic Northern Ireland road trip inspiration here are 12 amazing places in Northern Ireland. This is a list of incredible places in Northern Ireland for you to explore. From fascinating history, beautiful walks and incredible scenery you should add these places to your Northern Ireland bucket list! The salty air was slightly damp. Sea mist swirled mysteriously along the shoreline. The wind howled above us and the waves crashed beneath us. The lush green clifftops gave way to jet black boulders which had been rounded through the endless pounding of the Irish Sea. This was the wild Northern Irish coastline. I was entranced with its breath-taking rugged beauty. However, the real geological site we had come to see – the Giant’s Causeway, Clochán an Aifir – lay just around the corner. Given the atmospheric conditions, I half expected the giant Finn MacCool to suddenly appear. Would we see any giants on the Giant’s Causeway on this cold winter’s day? The Giant’s Causeway must be on everyone’s bucket list! There are no words to describe the peculiar shapes, the way the rocky pillars seemingly appear from nowhere and the mythical feeling at the Giant’s Causeway. Whilst dramatic geological forces have shaped this incredible place, it is not hard to imagine two giants arguing here. If you only have time for one trip outside of Belfast during your stay, make sure it is the Giant’s Causeway. The Giant’s Causeway is one of the most incredible places in Northern Ireland. Welcome to Belfast’s Peace Walls: the foreboding structures in Northern Ireland, that separate the firm Catholic neighbourhoods, from the predominantly Protestant. These are difficult and heartfelt circumstances. If you are a visitor which does not have the full lowdown on the historical and political history that has taken place here, make sure to delve deeper and speak with the locals. You can of course turn up to the walls yourself, but for the ultimate experience, I highly recommend riding with a local cabbie from the Black Cab Tours. They’re local, they grew up here, and they have been there and done that in terms of the troubles. With these cabbies, you will have the chance to visit both sides of the walls, both telling their own story. These walls are up to 25ft high and are here to stop the violence between those who identify as British and those who identify as Irish. They were built in 1969 and were only meant to last 6 months. Alas, they still stand and it is uncertain when they will come down. 69% of residents around these walls still believe they are absolutely necessary. On the walls you will find art and poetry which is touching and positive. Do not miss this. Come here for yourself and gain a deeper understanding of Belfast. Portaferry & Strangford are darling seaside towns found an hours drive from Belfast city centre along the Mourne coastal route. This stunning scenic drive will take you via some of Northern Ireland’s dramatic coastline, so the journey here is an experience in itself. There are many beautiful seaside towns in the UK. Click here to read all about another instagrammable coastal town in North Yorkshire. After exploring here, I’d strongly recommend grabbing the ferry over to Strangford for lunch. If you’re travelling the Mourne Coastal route, you can take your car over to continue the drive around, saving you a number of hours looping back around the Lough. Strangford is home to one of my favourite Irish pub in the area, the Cuan. The Cuan has a big Game of Thrones theme, with one of the doors made from the trees famous as the Dark Hedges after it blew down in a storm. Displaying an intricate map of Westeros, it’s not something you’ll want to miss if dining here. If you time your trip well, you can also attend one of their famous Game of Thrones murder mystery nights, complete with outfits from on set. If you want to extend your stay, you can stay in the pub’s bed & breakfast which is perfect if you’re planning on visiting Castle Ward, today better known as Winterfell. It’s a National Trust property which means you can go in any day of the week for a small fee. You’ll find the area a great base to explore the rest of the Game of Thrones set, along with a chance to see some real Northern Irish life. Derry, also known as Londonderry, is the second biggest city in Northern Ireland after Belfast. Located very close to the border with the Republic of Ireland, it has a tremendous amount of history, one of the many reasons to visit Derry. The Old Town is enclosed within the City Walls, which were built in the 17th century as a defense structure by the Irish Society for the English and Scottish Settlers. They are perhaps one of the most important attractions in Derry, together with the Museum of Free Derry, located in the neighbourhood of the Bogside, directly outside the walls. The Museum of Free Derry opened its doors in 2017, so it’s a relatively new attraction. Derry was at the centre of the conflict known as The Troubles, and this museum tells the story of what happened in that part of the city, known as ‘Free Derry’, during the period of 1968-1972. 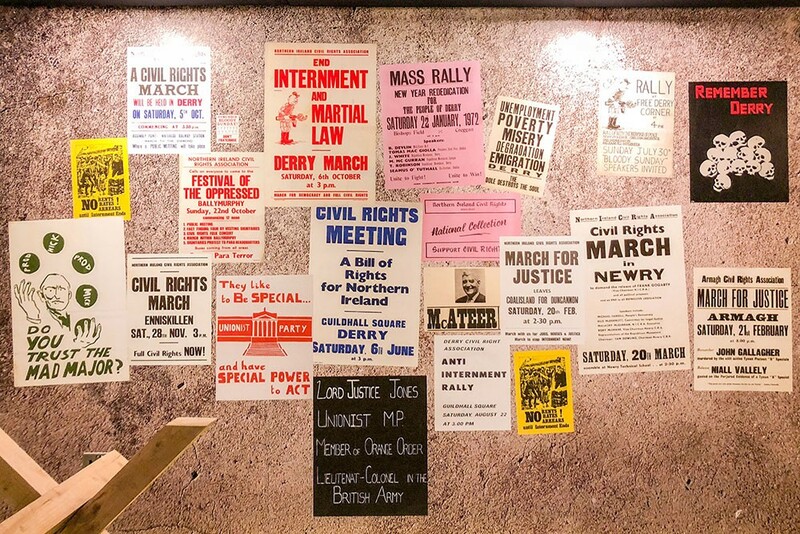 The museum covers the civil rights era, the Battle of the Bogside and the infamous Bloody Sunday, all the way to the healing process the divided city has gone through to this day. This museum is not nor does it intend to be a political museum, but it is rather an educational project that puts Derry in to a wider Irish and international context. And it does this very successfully. Suspended almost 30m (100ft) above sea level, the Carrick-a-Rede rope bridge is a popular pitstop on the Causeway coast. The thin bridge connects Northern Ireland to the tiny rocky island of Carrickarede and was first erected by salmon fishermen over 350 years ago. Crossing this famous 20 m long bridge is an exhilarating experience. The waves crash at the rocks beneath your feet, the wind whistles in your ears and the bridge constantly sways from side to side as you venture further across. The short journey is worth it, as it transports you to the beautifully scenic island of Carrickarede. Rugged, green and covered in wildlife, it depicts the Causeway coastline perfectly. Though what surprised me most is the white sandy beaches, turquoise waters and countless seals found in the area. If it wasn’t for the cold wind you could easily mistake it for somewhere more tropical! The island is small, but you are permitted to visit for as long as you’d like before returning across the bridge. To manage the crowds, the National Trust have set up a timed entry system. You can buy tickets on the day from 9.30am at the site entrance (only for same day bookings) or book online ahead of time. Timed tickets are valid for an hour, and the bridge is a 1km walk away from the car park. In September, we had no problems buying tickets on the day but at peak times (July and August) tickets are often sold out well in advance as tickets go on sale online 4 months before. So book ahead to avoid disappoint! Prices: Adults £9, Children £4.50, Free for National Trust members. The Titanic dry dock dwarfs its visitors. The sheer size and eerie atmosphere makes it impossible to forget the significance of RMS Titanic. Whilst few can visit her final resting place, it is quite possible to visit her birthplace in Belfast. RMS Titanic sat in the dry dock on the eve of her fateful maiden voyage. Visitors can descend 44 feet on slippery steps into the now abandoned dock. The wind howls as you walk the length of the dock, struggling to image the vast size of this ship. Titanic’s Dry-Dock was actually the largest dry dock ever constructed representing the pinnacle of Edwardian engineering. The Dry Dock is about 2 miles from the city centre. You can hop on a Translink bus or walk through the historic titanic quarter. It costs just £5 an adult for a self-guided tour. Aim to arrive as soon as the dry dock opens in order to experience the eerie site without the crowds. There is also a small atmospheric café which serves warm coffee, perfect for warming your cold fingers after walking around the breezy dock! If you don’t have time (or the funds) to visit the pricier Titanic museum the dry docks is the perfect alternative to spend an hour in the ghostly shadow of the infamous RMS Titanic. 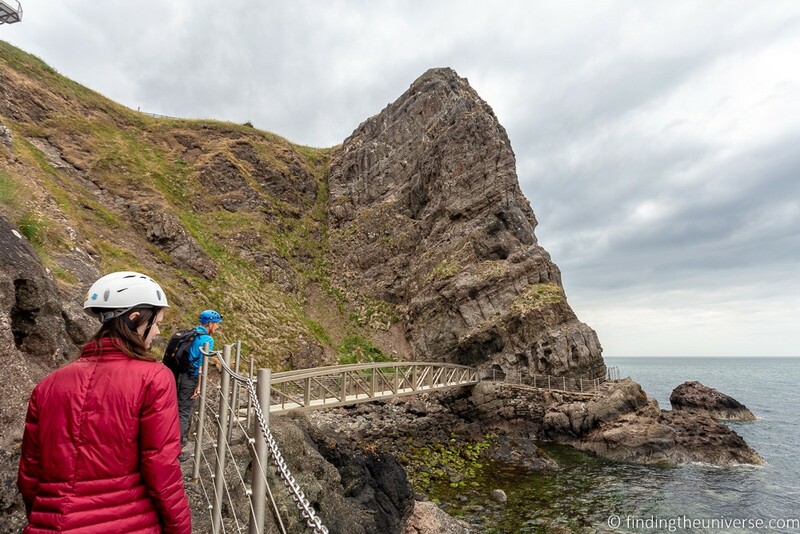 The Gobbins has been a popular tourist attraction along Northern Ireland’s Causeway Coastal Route for over a hundred years – with the first iteration of the attraction opening in 1902! But what is the Gobbins, and why would you want to visit it when in Northern Ireland? The Gobbins is a fantastic trail that hugs the cliffs at Island Magee in Country Antrim, around 17 miles drive north of Belfast. It consists of a carefully constructed path, which includes 15 bridges as well as railings, platforms and staircases. It’s not particularly long, but the views are incredible, with the chance to spot seals, porpoises and even whales. The path was originally built by an Edwardian era Irish railway engineer, and was created in part as an attraction to encourage people to take the train out of Belfast. It certainly worked – thousands of people flocked to walk the path when it opened. Over time however, the path fell into disrepair and was abandoned, until significant restoration led to it re-opening as a tourist attraction following reconstruction of the path in 2014 and 2015. Due to the narrow nature of the path, you can only visit the Gobbins on a guided tour, and these need to be booked in advance through the Gobbins Visitor Centre. The walk requires moderate fitness, as it is steep in sections, with many stairs. Due to the nature of the path, it can also be closed at short notice due to inclement weather or rock slides. But if you do get the change, we can highly recommend it, it’s quite a unique experience and one we very much enjoyed doing! Belfast is a great and fun city to visit, and one of the big highlights in town is the famous Titanic museum. Belfast has a long history with the infamous cruise ship, since the Titanic was actually built in this city. Since its opening in 2012, the Titanic Belfast quickly became one of the biggest tourist attractions of Northern Ireland. The building itself already has a very interesting design and once you enter, you get the chance to see and learn more about the story of the Titanic – from the idea to the construction and its tragic ending. While most people only know about the sinking (thanks to Hollywood), it’s been interesting to learn a little bit more about the story of how the ship got created. In the exhibition, you also get the chance to see reconstructions of the different cabins (1st, 2nd and 3rd class), giving you a very authentic insight into life in the early 20th century. I certainly enjoyed my visit and no matter if you’re fan of the Hollywood movie or not, a visit at the Titanic Belfast will be an interesting experience. Cuilcagh Mountain is a must see destination on any Northern Ireland road trip. The Mountain trail is a truly unique hike due to the boardwalk built in 2015 to protect the rare blanket bog from being destroyed by walkers. The hike became widely popular thanks to the power of social media and was nicknamed Ireland’s Stairway to Heaven after it’s heavy online presence. The walk requires hikers to battle 450 steps in order to reach the summit, however, this should not be a cause for alarm because the view from the top is 100% worth all the hard work and dedication. Once hikers reach the summit of the mountain they are rewarded with phenomenal views of Fermanagh, Lough Atona and the boardwalk. This hike is a 4 hour round trip, with a lot of possibilities to stop and take pictures of the stunning surroundings along the way. Throughout this hike walkers may come in contact with some wildlife such as cows and pass a stunning river on the graveled path before the boardwalk. The trail is well signposted and is the perfect way to spend a day out with family and friends. I recommend this hike to anyone on a road trip. For those driving by the area the Stairways is located one minute away from the Marble Arch Caves. It is possible to visit both attractions in the one day, making this area a must-see road trip destination. Derry is definitely one of my favourite cities in Northern Ireland. Although it’s quite a small city it has plenty of history and character. One of my favourite places to eat that I’d recommend to every vegan and vegetarian visitor to the city is the Cow Bog which is located in the heart of the city. The vegan burger is excellent and they also do soups which are great for those cold and wet Derry days. As they have a bit of a zero-waste ethos they usually cook only a few meals a day so the menu changes. Also sometimes they run out of food so if you do want to get lunch there make sure to go in around lunchtime and not too late in the day or everything may be eaten due to popular demand. They have a wide selection of cakes and their vegan brownies are just delicious. I’m not a coffee drinker myself but I have been told that the coffee is great. If you are a vegan with a sweet tooth heading to the UK, click here for more UK vegan cake inspiration. Other things that are great about Derry for travellers interested in being as eco as possible are that the city has loads of second-hand charity stores where you can pick up lots of good books and clothes. I also recommend you visit the zero-waste stall which can be found at 3 to 5 Society Street. It’s open at weekends and sells everything from eco soap bars to stainless steel straws. If you love Game of Thrones than one of the must do things when visiting Northern Ireland is going on a hunt to discover the filming locations of the series. As most of the series was filmed here, there are plenty of locations where you can compare the original footage from the movie with the real scenery and imagine how much CGI was involved in creating the scenes. One of these places is the cave in which Melisandre gives birth to the Shadow baby who ends up killing Renly, in the second season of the series. As a fan, you will surely recognise this scene as it was quite shocking. The Cushendun Caves are located just outside the village with the same name. Besides the caves, here you can stop and have a pint at one of the smallest pubs in Northern Ireland, Mary McBride, and take a look at their beautifully carved Game of Thrones door which depicts the eight episode of season six. The door was made with wood from the fallen trees of the Dark Hedges, after a violent storm knocked them down in 2016. Gnarly branches intertwine high above the path. The dark brown branches show their age through their many wrinkly knots. These mighty wooden giants have stood proudly for over a century. The beech trees on Bregagh Road are known as the Dark Hedges. The ethereal tunnel of trees was featured in the TV fantasy drama, Game of Thrones, and since then they have formed an essential stop on the perfect Northern Ireland road trip. You may recognise the Dark Hedges as the Kings road in the HBO show Game of Thrones. The Dark Hedges actually form the entrance to a grand estate. The Stuart family planted the rows of beech trees to impress visitors as they approached the entrance to their mansion. Nowadays, the dark hedges are easy to reach by car or coach from Belfast. Yet due to their popularity it can be very difficult to avoid the hoards of tourists at the Dark Hedges. Click here for tips and tricks on how to avoid the crowds at the Dark Hedges! Nevertheless, you should still add the Dark Hedges to your Northern Ireland bucket list. The beautiful trees are a fascinating site and a welcome addition to your Instagram feed! Fall in love with the Dark Hedges during your trip to Northern Ireland. Which place would you like to visit in Northern Ireland? 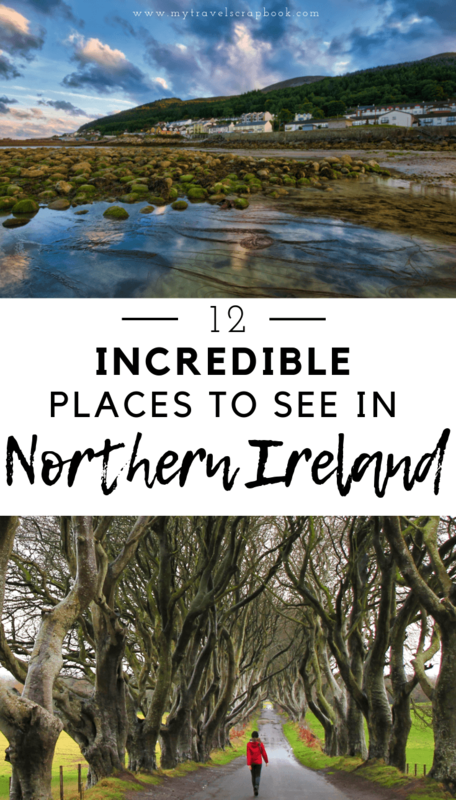 Which one of these incredible places in Northern Ireland would you like to visit? Would you prefer to walk up the stairway to Heaven, along the Gobbins, across the Giant’s Causeway or through the Dark Hedges? Or would you prefer to visit one of Northern Ireland’s best museums such as the Titanic museum or museum of Free Derry? Let us know in the comments below which place you would most like to visit and whether your Northern Ireland wanderlust has been awoken! What an absolutely scenic country! There is so much to do and see in Ireland!! I need to add this to my bucket list. P.s. gorgeous website as well! I’ve just come back from my fourth visit to Northern Ireland but I’ve still not made it to all these places yet. I just I’ll just have to go back! Not that I need an excuse. I think it would be so interesting to visit the Peace Walls and hear the locals opinions. I have realized that things in history aren’t always black & white and you always have people for and against. 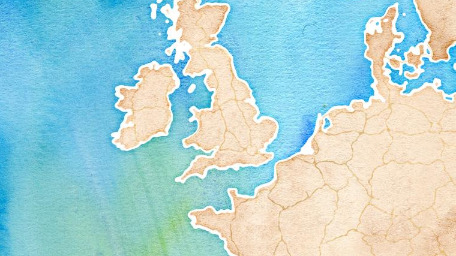 I’ve been living in the UK for 10 years but I’m ashamed to say I haven’t made it to Northern Ireland yet! But, if there’s any inspiration I need, this post has it! Ireland is definitely on my travel bucket list – the giant’s causeway and the rope bridge are definitely two things I’m dying to visit!